Transcript of an article from The Bathurst Times, 10 October, 1916, p. 4. PART IN THE FRAY, ANNIVERSARY OF THE START. It’s twelve months all but two days since the Coo-ees started their long march from Gilgandra to Berlin, and though they’re not there yet, most of them are still on the way. One is well beyond the borders of Germany — he is a prisoner of war, and is reported to be in a prison camp in Westphalia — several have been wounded, and two, including their famous leader, “Captain Bill” Hitchen, are dead. The Coo-ees started on the first stage of their march, the 330 miles trip from Gilgandra to Sydney, on Tuesday, Oct. 10. There were 25 of them then; but before they had covered half the distance the home town had sent another ten hotfoot to join them. These 35 Gilgandra men were good recruiting agents, for before they reached Sydney they had gathered in seven more men for every one of the original troop. They arrived just about 270 strong. Their example was followed all over the country, and recruiting marches were conducted from several points. None of them, however, caused such interest as that of the Coo-ees, and although public memory is always short it is probable that Captain Bill Hitchen and his men will always be remembered when Australia’s part in the war is talked of, certainly they will never be forgotten in Gilgandra and the other country towns which they passed through. Every town and township on the line turned out to meet them as they approached, and they were feted out and fed until their leaders began to fear that they would he killed by the kindness. The enthusiasm of the volunteers, too, was infectious. All along the road men dropped their work and joined the ranks. From Gilgandra alone there were three men with families. There was Captain Hitchen (officially he was only a Corporal; but he will always be remembered as Captain Bill), who had a family of three sons and two daughters; there was Signaller A. J. McGregor, who left behind him a wife and five young children; and there was Corporal J. McKeown, who left wife and four small McKeowns. Wee McGregor, as he was known all along the march, sold out a flourishing bakery business in Gilgandra to join the Coo-ees. He had three brothers at the front, and he wanted to follow them. On the way to Sydney another brother jumped into the ranks— five from one family. McKeown had also fought in the South African war, and had the soldiering blood in him. At Coonamble two young brothers named Hunt joined the ranks. Their father saw them start; but the thought of the parting was too much for him. A few days later he hurried after the boys, and at Bathurst he, too, joined the march. The Coo-ees were men of all ages. Captain Bill himself was 52, and though the rest all said they were under 45, the authorities in many cases had suspicions about them. On the other hand, there were three lads under the age of 18. When they reached Sydney on March 8 [sic] a number of them were rejected as medically unfit; but 200 eventually set sail for Europe. They didn’t all go together. Some were taken into the Light Horse, and others into the Engineers and Artillery; but about 180 went away as the 15th Reinforcements of the 13th. Battalion. In Egypt they were again split up; but the majority went into the 45th. Battalion. Those who stayed in Egypt were under fire three weeks after their landing, and the men who went to France were in the trenches in June. It used to be a military axiom that it took three years to train a soldier. In the case of the Coo-ees, the time spent in training was a little over three months. The people of Gilgandra are keeping up the anniversary of the start of the march on Tuesday by a social. They originally intended to devote the proceeds to purchasing Christmas hampers for the men; but the State War Council refused permission for this, and the money will now be devoted to the Repariation Fund. Numbers of private parcels are being made up, however, in the way of Christmas gifts, for the men. So far there have been but nine casualties among the Coo-ees. Corporal Hitchen died of diabetes in Harefield Hospital, in England, a few weeks ago. He was ill when he arrived in England, and went straight into hospital. He died two months later. When news of his death was received in Gilgandra, all the business houses closed their doors for two hours. Private Sid Houston, wounded, is a son of Mr. and Mrs. George Houston, of Wellington. He joined the Coo-ees there when he was only 17 years and three months of age. Private Dave Wagner, wounded, is a son of Mr. and Mrs. J. Wagner, of Valley Heights. He was only 16 years and 10 months old when he enlisted. Private D. S. Stewart was at first reported missing, but has since been traced to a prison camp in Westphalia, where he is a prisoner of war. He is the second son of Mr. and Mrs. A. Stewart, of Parkes-street, East Wellington, and was only 16 years and 9 months old when he enlisted. He was the youngest recruit with the Coo-ees. Another brother, who enlisted at 18, is in the trenches. Private Letcher, who has been killed in action, was a son of Mr. and Mrs. Letcher of Bathurst, and was only 17 years old when he joined the Coo-ees at Bathurst. Private G. Seaman, who also joined the Coo-ees at Bathurst, has been reported wounded. Private W. E. Hunter, Redfern, enlisted at Geurie, and when the Coo-ees were in Orange he received a letter from his mother stating that his two brothers had been killed at the Dardanelles. He is reported wounded. The Farmer and Settler reported that a recruit that joined the Coo-ee March at the village of Colyton on 10th November 1915 ‘… was one of the family of McGregors that has already given five sons to the Empire. As the family said their brave but tearful farewells to the sixth McGregor, all that witnessed that incident realised the fine loyalty of the McGregors…’. The Sydney Morning Herald, and The Cumberland Argus and Fruitgrowers Advocate, both reported that at Colyton ‘Here it was that a young man stepped forward at the call for recruits. He was a member of a family – the McGregors – that had already given five sons to the Empire’s cause, and he was the sixth. A little family group bade him farewell, as with some determination he took his place in the ranks…’. ‘As the Gilgandra “Coo-ees” marched out of the little village of Colyton (near Parramatta), Captain Hitchen remarked that more men were wanted. On the word MacGregor stepped forward. By him stood his mother, in tears, for MacGregor is the “last of his tribe.” The “Coo-ees” already had one MacGregor with them; the other four at the front. It was a tense moment; eyes glistened, and even the “Coo-ees,” who had seen many such partings, swallowed hard or looked round at the scenery. But MacGregor—he must be one of “the” MacGregors—was not moved. He took his place, and the column moved off’. Andrew McGregor (1858-1910) and Alice Mary McGregor (nee Hunt) (1862-1897), who both had died before the First World War, had six sons: Andrew James McGregor (1882-1938) who joined the Coo-ees at Gilgandra; Arthur Ernest McGregor (1884-1969) who signed up to join the Coo-ees at Springwood; William George McGregor (1889-1941) who enlisted in the AIF on 2nd February 1915 (Service no. 2064); Oscar John McGregor (1891-1932) who enlisted in the AIF on 1st July 1915 (Service no. 2886); Frederick Herbert McGregor (1893- 1939)[who does not appear to have enlisted]; and , Charles Henry McGregor (1896-1916) who enlisted in the AIF on 7th May 1915 (Service no. 2657). 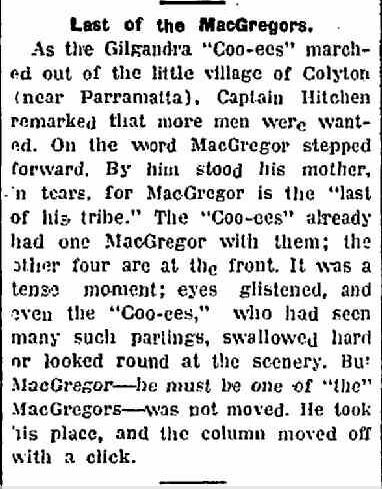 It is not known which McGregor brother was reported in the newspapers to have joined the Coo-ees at Colyton on their way from Penrith to Parramatta on Wednesday 10th November 1915. There was no official count for any recruits joining the Coo-ee March at Colyton. Three of the brothers (William George McGegor, Oscar John McGregor, and Charles Henry McGregor) had already enlisted earlier in 1915, before the Coo-ee March. It may possibly have been one of the two brothers who had already joined the Coo-ee March (Andrew James McGregor or Arthur Ernest McGregor), who may have briefly left the march to say goodbye to his family and/or finalize his affairs in Sydney (where both their next of kin lived), before rejoining the march at Colyton. Alternatively it could possibly have been Frederick Herbert McGregor who may have stepped forward to try and join up to be with his two brothers who had already enlisted in the Coo-ee March, (and his other three brothers who had enlisted earlier in 1915), and who may then not have passed the medical examination at Parramatta that evening. Only 27 of the 41 who presented at Parramatta passed the medical examination. However, only five of the six McGregor brothers appear to have been successful in enlisting in the AIF in the First World War. 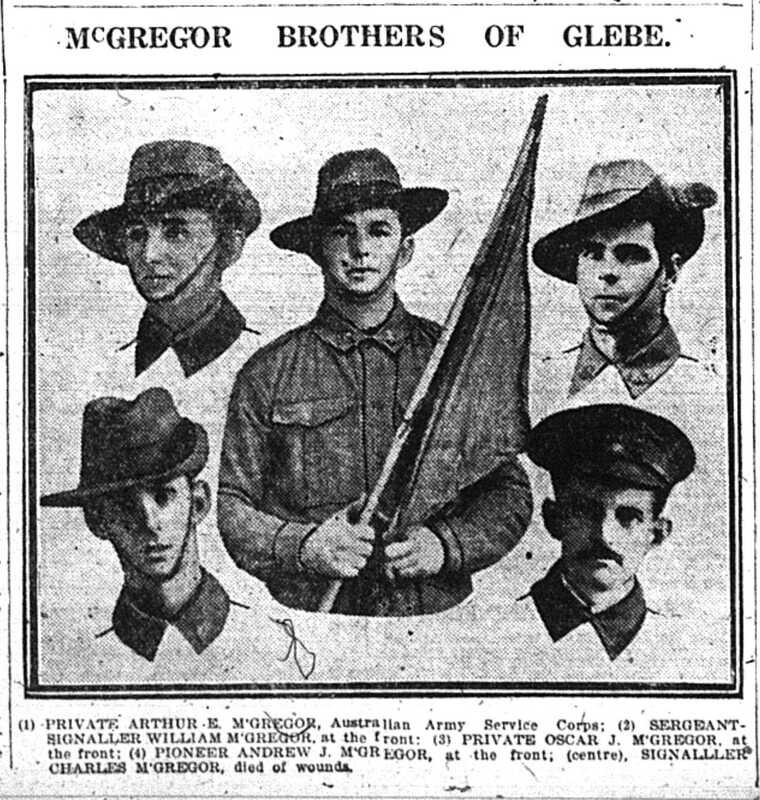 A photograph of the five McGregor brothers who enlisted in the AIF was published in the Daily Telegraph on 22nd September 1916. The photograph had the caption: ‘(1) Private Arthur E. McGregor, Australian Army Service Corps; (2) Sergeant-Signaller William McGregor, at the front; (3) Private Oscar J. McGregor, at the front; (4) Pioneer Andrew J. McGregor, at the front; (centre), Signaller Charles McGregor, died of wounds”. If it was Frederick Herbert McGregor who tried to join his two brothers who had already enlisted in the Coo-ee March at Colyton, there is no mention of him in an article about the Coo-ees that was published a year later in the Sunday Times, which reported that ‘Wee McGregor [Andrew James MacGregor], as he was known all along the march, sold out a flourishing bakery business in Gilgandra to join the Coo-ees. He had three brothers at the front, and he wanted to follow them. On the way to Sydney another brother jumped in the ranks – five from one family’. ‘McGregor brothers of Glebe’, Daily Telegraph, 22 September 1916, p. 9. Per his military service record (regimental no. 4855), Andrew James McGregor was born at Sydney, N.S.W. He gave his age as 34 years and 2 months, his marital status as married, and his occupation as baker. His description on his medical was height 5 feet 4 inches tall, weight 8 stone 9 lbs, with a dark complexion, dark blue eyes, and dark hair. His religious denomination was Anglican. He claimed that he had 10 years’ experience in the Colonial Forces. He as attested by Captain Nicholas at Gilgandra on the 9th October, 1915, after completing his medical at Gilgandra on 7th October 1915. He sold his I.X.L. Bakery business in Gilgandra before joining the Coo-ee March at Gilgandra. His younger brother Arthur Ernest McGregor also joined the Coo-ee March, being attested, and completing his medical examination, when the Coo-ees were at Springwood. After completing the Coo-ee March Andrew James McGregor went to Liverpool Camp as reinforcement for the 13th Battalion. On his embarkation roll his address at time of enrolment was 39 Fotheringham Street, Marrickville, Sydney, N.S.W., and his next of kin is listed as his wife, Mrs. A. [Alice] McGregor, at the same address. On 8th March 1916, Private McGregor, along with many of the other Coo-ees, departed Sydney on the HMAT Star of England, arriving in Egypt on the 11th April 1916. On 16th April 1916 he was transferred to the 4th Pioneer Battalion at Tel El Kebir, Egypt. On 4th June 1916 Private McGregor, along with several other Coo-ees, left Alexandria aboard the Transport Scotian bound for France, and arrived at Marseilles on 11th June 1916. Private McGregor served on the Western Front with the 4th Pioneer Battalion until the end of 1916, when on 22nd December 1916 he transferred to the 2nd Australian Field Bakery. Private McGregor was granted 10 days leave to the United Kingdom on 29th June 1917. On the 24th June 1918 Private McGregor was admitted to hospital with Sclerosis Spinal Cord. He was evacuated to hospital in England on 30th June 1918. He began his return to Australia aboard the Transport HT Gaika on the 8th November 1918, arriving in Australian on the 29th December 1918. Private McGregor was discharged on 4th September 1920. On Wednesday 10th November 1915, the Coo-ees left Penrith to march the four miles to St. Marys, arriving at about 8.30 am. There they ate an elaborate breakfast on tables under the shade of the trees in Victoria Park, prepared by the ladies of St. Marys. Here they gained another recruit, Samuel Luke, a 38 year old single labourer who had lived on Mamre Road with his mother and stepfather. (His name is listed on the St. Marys War Memorial in Victoria Park in St. Marys). At 10 am the Coo-ees left St. Marys and travelled down the historic Western Road (now the Great Western Highway) to the village of Colyton, where they were presented with a sum of money which had been collected by the Colyton school children, and presented with a tanned sheepskin vest which the headmaster Mr Aston had arranged. The Nepean Times reported that at Colyton ‘another recruit, viz Mr J Barnett, joined’. I found no service record for a J. Barnett joining the Coo-ees at Colyton, but did find a 1919 article in the Nepean Times which reports on a welcome home speech for a returned soldier – Driver Clarrie Barnett – given by Mr J Aston, headmaster of Colyton Public School where the returned soldier had been a student, whom he described as having ‘linked up with the Coo-ees when they passed through Colyton’. Clarrie (Clarence Roy) Barnett, who had been a 21 year old bank teller from Mount Druitt, had signed his attestation paper in his service record at Liverpool on the 10th November 1915. So it appears he was a Coo-ee “for a day”, marching out of Colyton with the Coo-ees when they left that village, then making his own way further down the road to Liverpool Camp to enlist that same day. The Farmer and Settler reported that a recruit that joined at Colyton ‘was one of the family of McGregors that has already given five sons to the Empire, and that ‘as the family said their brave but tearful farewells to the sixth McGregor, all that witnessed the incident realised the fine loyalty of the McGregors’. I have only found service records for five of these six McGregor brothers, who were the sons of Andrew and Alice M. McGregor. The photograph below shows the five sons who enlisted. Two of these brothers joined the Coo-ee March – Arthur Ernest McGregor who signed his attestation paper at Springwood on the 8th November 1915 (when the Coo-ees were at Springwood), and Andrew James McGregor (the eldest), who joined the Coo-ees at the start of the march at Gilgandra. 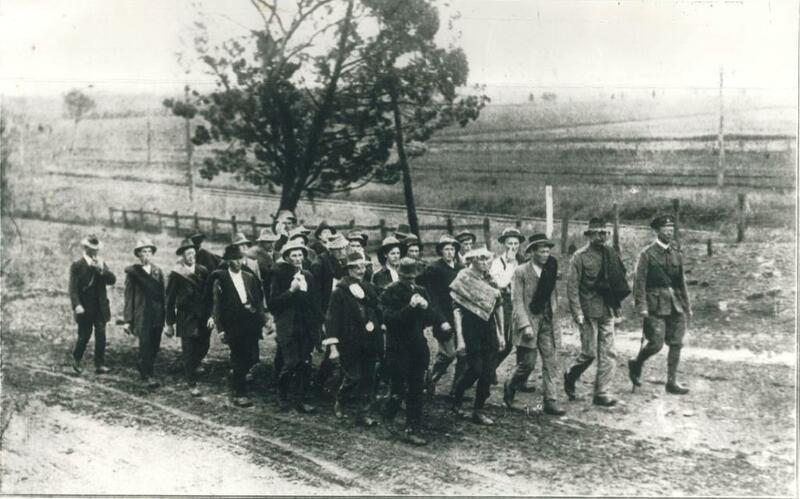 Both were married, and both their families were living in Sydney at the time, so it appears that one of them left the march temporarily and then rejoined the march at Colyton, accompanied by some family members to see them off. After leaving Colyton the Coo-ees marched to Eastern Creek, where they were met by the President of Blacktown Shire Council, Col. Pringle, and Cr. James Angus, who was president of the local recruiting committee, and had lunch provided by the ladies of Rooty Hill and Eastern Creek in the Walgrove school grounds. The Coo-ees then proceeded to Prospect and on to Parramatta. Transcript of an article from The Sunday Times, October 8, 1916, p. 9. It’s 12 months all but two days since the Coo-ees started on their long march from Gilgandra to Berlin, and thought they’re not there yet, most of them are still on the way. One is well beyond the borders of Germany – he is a prisoner of war, and is reported to be in a prison camp in Westphalia – several have been wounded, and two, including their famous leader, “Captain Bill” Hitchen, are dead. The Coo-ees started on the first stage of their march, the 330 miles trip from Gilgandra to Sydney, on Tuesday, Oct 10. There were 25 of them then ; but before they had covered half the distance the home town had sent another ten hotfoot to join them. These 35 Gilgandra men were good recruiting agents, for before they reached Sydney they had gathered in seven more men for every one of the original troop. They arrived just about 270 strong. Their example was followed all over the country, and recruiting marches were conducted from several points. None of them, however, captured such interest as that of the Coo-ees , and although public memory is always short, it is probable that Captain Bill Hitchen and his men will always be remembered when Australia’s part in the war is talked of. Certainly they will never be forgotten in Gilgandra and the other country towns they passed through. Every town and township on the line turned out to meet them as they approached, and they were feted and fed until their leaders began to fear they would be killed by kindness. The enthusiasm of the volunteers, too, was infectious. All along the road men dropped their work and joined the ranks. From Gilgandra alone there were three men with families. There was Captain Hitchen (officially he was only a Corporal ; but he will always be remembered as Captain Bill), who had a family of three sons and two daughters ; there was Signaller A. J. McGregor, who left behind him a wife and five young children ; and there was Corporal J. McKeown, who left a wife and four small McKeowns. Wee McGregor, as he was known all along the march, sold out a flourishing bakery business in Gilgandra to join the Coo-ees. He had three brothers at the front, and he wanted to follow them. On the way to Sydney another brother jumped into the ranks – five from one family. McKeown had fought in the South African war, and had soldiering in his blood. At Coonamble two young brothers named Hunt joined the ranks. Their father saw them start ; but the thought of the parting was too much for him. A few days later he hurried after the boys, and at Bathurst he, too, joint the march. The Coo-ees were men of all ages. Captain Bill himself was 52, and though the rest all said they were under 45 the authorities in many cases had their suspicions about them. On the other hand there were three lads under the age of 18. When they reached Sydney on March 8 [sic] a number of them were rejected as medically unfit ; but 220 eventually sailed for Europe. They didn’t all go together. Some were taken into the Light Horse and others into the Engineers and Artillery ; but about 180 went away as the 15th Reinforcements of the 13th Battalion. In Egypt they were again split up ; but the majority went into the 45th Battalion. Those who stayed in Egypt were under fire three weeks after their landing, and the men who went to France were in the trenches in June. It used to be a military axiom that it took three years to train a soldier. In the case of the Coo-ees, the time spent in training was a little over three months. A record of their doings is being kept by Mr. A. H. Miller, of Gilgandra, who took part a leading part in organising the march. He is still collecting details, keeping a list of those who have fallen, and the experiences the men have met with. He also communicates with their relatives, whenever news of any of the men arrives. The people of Gilgandra are keeping up the anniversary of the start of the march on Tuesday by a social. They originally intended to devote the proceeds to purchasing Christmas hampers for the men ; but the State War Council refused permission for this, and the money will now be devoted to the Repatriation Fund. Numbers of private parcels are being made up, however, for Christmas gifts, for the men. So far there have been but nine casualties among the Coo-ees. Corporal Hitchen died of diabetes in Harefield Hospital, in England, a few weeks ago. He was ill when he arrived in England and went straight into hospital. He died two months later. When news of his death was received in Gilgandra, all the business houses closed their doors for two hours. 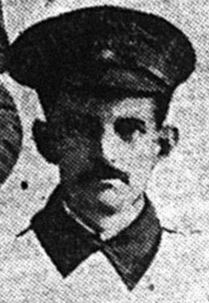 Private Victor Quinton, of Gilgandra, is wounded, though he was at first reported missing. He is a son of Mrs. A. Lumsey, of Gilgandra. Private Sid Heuston, wounded, is a son of Mr. and Mrs. Geo. Heuston, of Wellington. He joined the Coo-ees there when he was only 17 years and three months of age. Private Dave Wagner, wounded, is a son of Mr. and Mrs. J. Wagner, of Valley Heights. He was only 16 years and 10 months old when he enlisted. Private J. Wiggins, wounded, is a son of Mr. E. Wiggins, of Springwood. He and his mate, Dave Wagner, both enlisted from Springwood, the only recruits in the march from the township. Private C. Crease, wounded, joined the Coo-ees in the mountains. He is a brother of Mrs. P. Letham, of Simmons-street, Enmore. Sgt. T. Thorne, who died of illness in England, was 23 years of age. He was the only son of Mrs. and the late Mr. G. Thorne, of Thorneycroft, Lawson. His father died suddenly from heart failure a month after the boy left for the front. Private D. S. Stewart was at first reported missing, but has since been traced to a prison camp in Westphalia, where he is a prisoner of war. He is the second son of Mr. and Mrs. A Stewart, of Parkes-street, East Wellington, and was only 16 years and 9 months old when he enlisted. He was the youngest recruit with the Coo-ees. Another brother, who enlisted at 18, is in the trenches. Private Oliver James Harmon, of Granville, killed in action, was a son of Mr. and Mrs. W. H. Harmon, of Alfred-street, Granville. He joined the Coo-ees, many of whom he had known out West, at Parramatta. His younger brother, Percy, is on H.M.S. Phantom, and another is in camp at Liverpool. Private C. Marchant, accidentally wounded in Egypt and invalided home, is a son of Mr. and Mrs. E. Marchant, of Gilgandra, at which township he joined the Coo-ees. He was prominent in boxing circles in the West, and also a member of the Gilgandra Waratah Football Club and the League of Wheelmen. Private Albert Nelson, wounded (second occasion), is the son of Mr. and Mrs. R. Nelson, of Gilgandra. He joined the Coo-ees at Liverpool Camp, and sailed for the front with them on March 8. When he was wounded on the first occasion he remained on duty. This time he was wounded in three places – knee, back and foot. Private R. Uhr (invalided home). Private J. Morris, Parramatta (killed in action). Private G. Seaman, Bathurst (wounded). Private W. E. Hunter, Redfern (wounded), enlisted at Geurie, and when the Coo-ees were in Orange he received a letter from his mother stating that his two brothers had been killed at the Dardanelles. Transcribed from The Farmer and Settler, 12 October, 1915, p. 3. ‘THE ROUTE MARCH. Gilgandra to the Coast TRIUMPHANT SEND-OFF BY THE PEOPLE. Gilgandra’s greatest of all events, the start of the route march, became a fact of history on Sunday last, when the contingent after a simple religious ceremony stepped out on its long march to the coast. On Saturday, when the ‘Farmer and Settler’ special reporter, who will march to Sydney, arrived at Gilgandra, he found Captain Nicholas and Drs. Burkitt and Cooper, of Dubbo, on the ground. Captain Nicholas has been appointed to take charge of the contingent, and be will be their leader and instructor all the way through to Sydney. On Saturday afternoon twenty-five recruits were sworn in. Two failed to pass the doctor, but they will march through to the coast nevertheless. The number of recruits would have been double if the recruiting association had not been compelled to wait so long for the permission of the military authorities, the result being that many men grew tired of waiting, and went into camp. The doctor said that the Gilgandra men were as fine a body of recruits as he had seen, with good feet and sound constitutions. On Saturday night a torchlight procession paraded the town, headed by the band. The recruits were followed by the rifle club and the boy scouts. In the interval of a picture show, Major Winn, of Sydney, and Private Lee, the ex-clergyman recruit, made special appeals to the young men to volunteer. There were fully three thousand persons, almost the whole population of the district, at the open-air consecration service on Sunday morning, when the Rev. W. Jenkins commended the men to their Creator. The shire president, Mr. Barden, said he was sure that the twenty-five starting out would be five hundred at the end of the long march. Almost the whole of the people, the largest gathering ever seen at Gilgandra, accompanied the march to Boberah, where a general programme of hand-shaking took place. A guard of honor of young horsewomen rode at the head of the procession, and the local recruiting association and shire councillors took part. Captain Nicholas formed up his little force — grown already to thirty-one men; and Mr. W. T. Hitchens had the honor of giving the first words of command–‘Quick march.’ Amid resounding cheers the route march had begun, and it was followed for several miles of its long journey, by a great cavalcade of horses and vehicles. Then there was a halt, with more good-byes, more cheers, and the rifle club fired a parting volley. The heat was intense, and the dust hung over the troops like a pillar of cloud — a fiery cloud, so that when the first stop, Marthaguy, was reached, all were grateful for the lunch spread by the residents, and not less for the facilities provided for a wash and a freshen up. At Marthaguy one new recruit fell in. Many of the Gilgandra folk still followed the column. The young daughter of a prominent citizen left her car and marched alongside the men for some distance; she announced her intention of being present in Martin Place at the finish, and declared that if she had been a boy she would have marched all the way, and gone to the front with the contingent. It is a pity that some of the boys have not the spirit of the girls. At Balladoran the townspeople met the column a mile out of town and escorted them to their camp with banners, and gave them a hearty welcome. The camp was reached at five o’clock, and here another recruit joined the column.